Film reviews, photography, and short stories, amongst other things. Most would instinctively describe cinema as a visual art-form, but one look at the history of everyone’s favourite (mostly) English-language cinema celeb-fest, the Oscars, shows that awards have been given for various aspects of a film’s audio since the third award ceremony in 1930 (Best Sound Recording). Whilst it’s not uncommon to have discussions about favourite soundtracks and movie themes, if A Quiet Place doesn’t cast sound design into the public consciousness nothing will. From the sound of unseen foes approaching (even more effective when implemented as a wandering “sound element”, more on this later), heartbeats racing as the tension skyrockets, to the piercing feedback of a young girl’s cochlear implant, sound plays a crucial role in the generation of tension. Marco Beltrami’s soundtrack’s not half bad either, the veteran horror scorer at it again with a mix of dissonant ambient tracks implemented in moments of action or threat and decidedly Jóhann Jóhannsson-esque minimalist beauties to lift the more sentimental moments to a higher plane. I actually stayed for the credits just to note the composer, always a sure sign of a great soundtrack. I am an audiophile. I have always been obsessed with music, radio, and sounds natural and not alike: thunderstorms, bike tyres on loose gravel, briefcase clasps closing, the sound of oars skimming the water’s surface (the best thing about rowing)… So it may surprise some who know me well that it wasn’t actually the sound effects or the music that most impressed me: it was the silence. “If they hear you, they hunt you.”: one glance at the movie’s tagline tells us we’re in for a lot of holding our breath and tip-toeing around. It’s a simple yet effective strategy, and the suspense created by noticing anything that could create or cause the slightest noise – or even not so slight, such as an upturned nail on the stairs or Evelyn’s (Emily Blunt) baby bump – is so intense that I found myself almost longing to just get it over and done with. Almost. In reality, the only moment of relief permitted by the film is a simple yell shared by father and son, protected by a barrier of noise provided by the deafening roar of a waterfall. 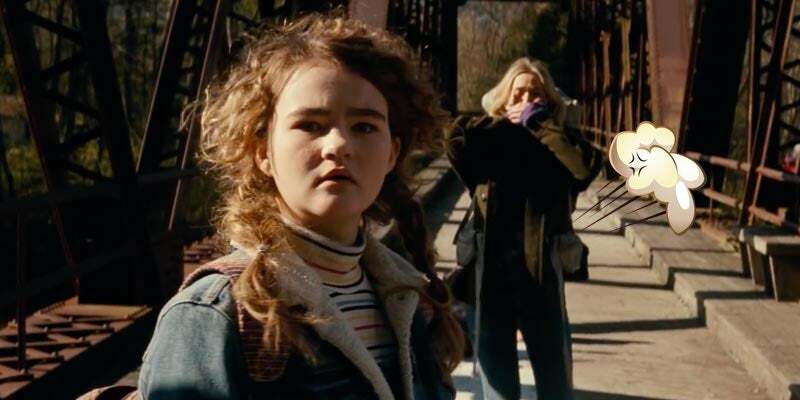 Going beyond elective silence, Evelyn and Lee’s (John Krasinski) young daughter Regan (like Millicent Simmonds who played her) is deaf, in itself not an entirely unique concept – a character’s deafness was also used to wonderful effect in 2016’s Hush (here I feel obliged to mention that the writing of A Quiet Place was already underway in 2013) – but a young girl and her family’s struggle to come to terms with her disability would be difficult enough without the imminent threat of death at the claws of an alien predator (or “Death Angels” as they are nicknamed). The family’s ability to communicate non-verbally, undoubtedly initially for Regan’s benefit, is what allowed them to adapt and survive in the soundless world that the majority of humankind had failed to adapt to (civilisation as we know it all but wiped out), and – without giving too much away – the unique challenges of facing such a condition ultimately provide the Abbotts with the knowledge necessary to have a fighting chance at survival again towards the film’s close. Perhaps I, having grown up with a close friend who himself has a cochlear implant, am particularly attune to such themes, but Regan’s reaction to another of Lee’s failed attempt to fix another aid and provide some degree of hearing – fragile, restrained, and utterly devastating – left me in tears, and is unquestionably my favourite scene in the film. The maturity of such restraint in the face of pain, both physical and emotional, is what really makes this film so special (testament to the talents of Blunt and Millicent in particular, without whose measured and delicate performances such emotional impact would have been lost). More than just a scary concept with a lot of jump scares, A Quiet Place is about a family’s ability to adapt and overcome. Here, we leave behind the all too familiar “every man for himself” survival concept in favour of a family’s altruism, and there is no limit to how far they will go to save each other. It’s a story of loss and sacrifice, and of acceptance. If I had to describe A Quiet Place in a word, it would not be “fear”, but “love”. PS: I normally wouldn’t talk too much about where I watched a film, but in this instance I feel I must say a few words before I go, as it enhanced the experience so much. A Quiet Place was the first film I have watched in a screen fitted with Dolby’s “Atmos”, showcased spectacularly by this film in which sound is so important. I’m not very well informed on the particulars of how it works, but sound elements move in a three dimensional space rather than the conventional “channels” used previously, giving a move specific sense of location (including a sense of “height”). I don’t think I will ever tire of revisiting this neo-noir masterpiece. As a forensic biologist, it may not surprise many that I am not averse to a good crime film, but of the endless sea of such films this is one of very few that in my opinion possesses the necessary quality of story and acting to not only permit an enjoyable re-watch, but arguably demand at least one – despite one already knowing what’s in the box the outcome. In fact, it is only upon this most recent (at least fifth) viewing of the film that I questioned how an hour-and-one-minute drive could possibly have been taken us from the seemingly eternal torrential rain of the unnamed city in which the majority of the film is set to the bone dry expanse of desert of the final scene – requiring a degree of suspension of disbelief that may not have passed unnoticed if not for the quality of story. Aside from the gloomy colour design, weather, and very clever use of lighting (or lack thereof), it’s Seven’s expert use of the unknown and unseen that makes for such an intense experience. I am sure anyone who has lived at one point or another in a large city, particularly one blessed with bad weather (in my case growing up in London and later moving to Glasgow), feels a certain familiarity with “the city” (as close to a name as viewers are given, though known to have been inspired by a rather unhappy time spent by then-struggling screenwriter Andrew Kevin Walker in New York). I am sure a large part of what makes this movie so impactful for many is that the events of the film could be unfolding in “our” city, whichever that is; no matter how shocking or sad, the stories that affect how safe we feel will always be the local ones – we can’t just write them off as some far-off evil from which we are safe and sound. What’s more, none of the murders being investigated are shown on-screen (though the film does end with an execution), instead showing us the aftermath and leaving the rest up to our imagination. This breaks down the audience/film barrier, putting the action inside our heads and thereby forcing us to live the scene. In fact, in two cases – lust and envy – we don’t see the victim at all, and yet they are arguably the two most horrific and chilling crimes in the movie, thanks to both extremity of concept and accompanying performances (Leland Orser and Brad Pitt) so genuinely convincing that it’s hard to believe that you are watching actors and not real victims. We are biologically programmed to be afraid of the unknown – the ability to recognise and evade dangers (including identifying potential/novel threats) is a fundamental principle of survival of the fittest – and Seven exploits this masterfully. Until the killer’s surprising (but necessary – the police seemingly little closer to catching him than they were to begin with) decision to willingly hand himself in to the police just over two-thirds in (a surprise designed to include the identity of the actor portraying him; though now common knowledge, Kevin Spacey was not named in any of the film’s marketing or the opening credits), one is permitted an extremely limited picture of who the killer may be. This, combined with a collection of victims spanning a wide range of walks of life and socioeconomic status make him all the more terrifying (he could be anyone) and the crimes all the more unsettling (I am sure most of us can relate in some way, shape, or form to one of the victims).